Home » Establishing Standards in Strongman: Are You Strong Enough for Success? 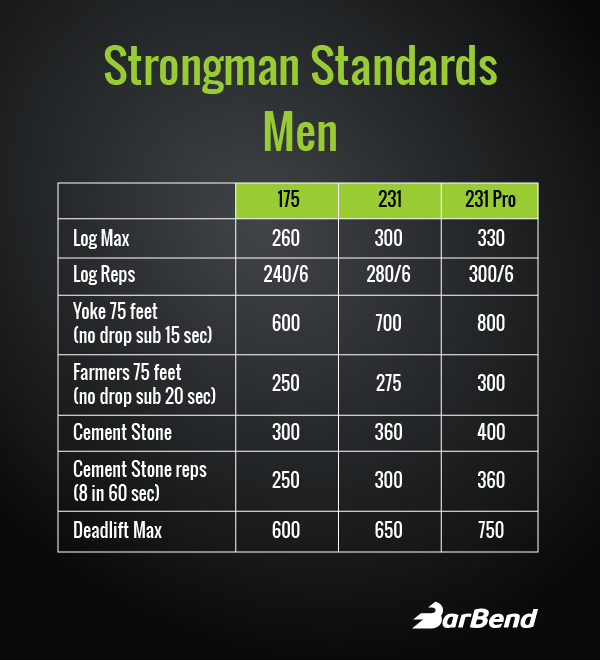 Establishing Standards in Strongman: Are You Strong Enough for Success? Self honestly. It’s a tough asset to find and develop, but for the strongman game you can’t excel without it. While having a positive mental attitude is important, convincing yourself that you are better than you actually are is a sure way to stifle progress and lose credibility. In powerlifting and weightlifting there are qualifying totals that an athlete can rely on to gauge their progress and pick where they will compete. 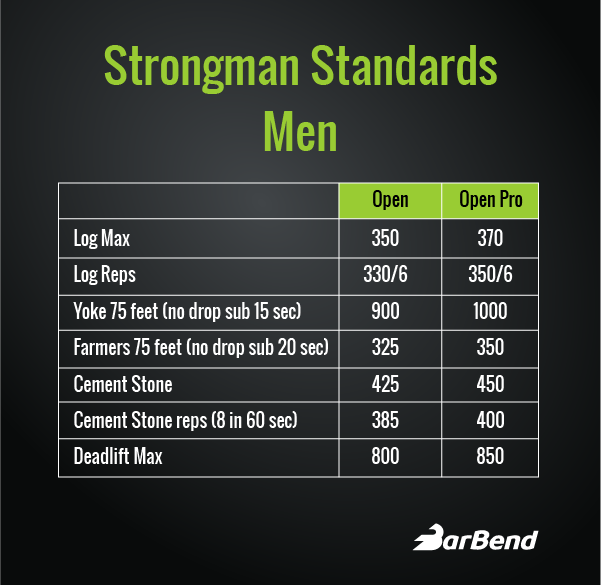 In strongman we have so many different events that require multiple skill sets that a true benchmark may evade certain competitors. To help you set some goals and proceed to the next level, I’ve constructed four charts that can be used to see what is approximately competitive at the national level and then where the professionals are. When you look at this chart, keep in mind it is designed to see what the well rounded strongman is capable of accomplishing. There will be outliers that can smash many of these numbers, as this is not to be used to set world records, but as a tool to determine your weak spots. You are a great presser and are off the charts according to these numbers but your deadlift lags. It might be time to stop adding to your press and invest more energy bringing up the pull. You have been progressing nicely and are at all of the amateur numbers but still haven’t gotten your pro card. Do you lack in speed and accuracy? OR are you having a hard time executing when you compete? A smaller show presented itself and you qualified for nationals but you are way off these numbers. Do you create a program that will advance your standings and strive for self improvement or do you just roll the dice and blame a poor performance or a myriad of things other than being ill prepared? A key to this chart is to not massage the numbers to your favor. Ask yourself if those reps you performed were quality contest reps. Weigh your equipment that can suffer loss of mass (lower quality bumpers, homemade stones, sandbags, wood logs, etc.). Realize that a 238lb stone that you can rep five times in sixty seconds might actually be cut to four reps when a true 250 is rolled out at a contest. After all, the greatest prize most people receive from strongman competitions isn’t a check for thousands of dollars, but a discovery or their true self and where their mental and physical limits lie.